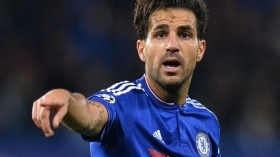 Cesc Fabregas heading for winter Chelsea exit? Chelsea midfielder Cesc Fabregas has reportedly been identified as a prime target for Turkish club Fenerbahce during the ongoing transfer window. Fabregas is presently in his fifth season with the west London giants but his campaign has been far from fruitful with just one start in the top-flight. Moreover, the Blues have been reluctant to offer him a new contract with his current deal expiring in six months' time and this has further intensified the speculation regarding his future. According to Haberturk, the Spain international could be offered a fresh challenge this month with Fenerbahce keen on luring him to Istanbul to revive their faltering season. It is added that club president Ali Koc has already made the trip to the English capital to discuss the same and a deal could be concluded in the near future, provided the player favours the switch. Fener have gone through one of their worst spells in the Turkish top-flight this term and they are currently in a relegation battle with just three wins from their 17 matches to date.